The 1st annual Bronx Family Day will inspire creativity in children and adults alike through its interactive programs and musical delights. Featuring a lively, exciting mix of Latin and American inspired music and dance artists, the entire family will be entertained! BombaYo emerges from the streets and schoolyards of the Bronx, where salsa and hip hop were born. Under the musical direction of co-founder Jose Ortiz a.k.a Dr. Drum, a self-taught Afro Caribbean percussionist, who has engaged and encouraged children and families to explore their own musical talents, he oversees BombaYo, a group of teens that bring youthful energy to a centuries old Afro Puerto Rican music and dance tradition, Bomba. Bomba was developed in Puerto Rico over 300 years ago by enslaved Africans from parts of West Africa and the Kongo region and also includes influences from the Spanish colonizers and native Taino people. Bomba is more of an experience than a show. It’s where singing, dancing and drumming come together in a community celebration of life. Boricuas on the island and stateside are reviving this tradition and in turn uncovering part of their cultural heritage. A former member of a 1980s rock band, Grammy award winner Dan Zanes is now a favorite children’s artist. With a mix of new songs and old favorites, his music incorporates languages, cultural traditions and musical genres from areas across the globe. Since 2000, Zanes has released 6 children’s albums with Catch that Train! winning a Grammy in 2007 and ¡Nueva York! winning an Independent Music Award in 2009. Singer, songwriter, producer Jose Conde has been much celebrated for his work with the Cuba-centric band Ola Fresca. His two albums with Ola Fresca, (R)Evolucion and AY! Que Rico delved deep and deviated from traditional Cuban music forms, liberally juxtaposing and fusing rhythms and playing with language to achieve a fresh sound. The Brooklyn-based, Miami-raised son of Cuban immigrants, Conde has been featured in numerous Putumayo and Rough Guide compilations. Tonight marks the official unveiling of music from his upcoming solo 2010 release with atmospheric grooves supplied by his funky new, pan Latin powerhouse of a band, the nu Latin Groove. Led by singer Jose Conde, Baby Loves Salsa features the band Ola Fresca, with members who are some of the best in contemporary salsa music. 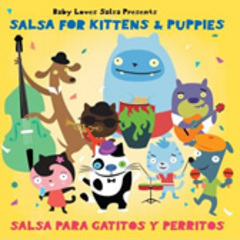 Through bilingual music, Baby Loves Salsa teaches language skills while telling the story of a group of kittens and puppies (gattitos y perritos) from the streets of New York City who go on to become the best salsa band in the land. This imaginary band of cats and dogs will have the whole family up and dancing to the upbeat blend roots, Latin, funk, jazz and dance tunes.